I have visited many schools and libraries up and down the country and will happily visit yours! I have read at the Roald Dahl Museum in Great Missenden, at the Edinburgh Book Festival and even on the London Eye. If you are interested in booking me to visit your school please contact me direct at jamierix0@gmail.com. My sessions are story led, that is to say I read from Grizzly Tales, Alistair Fury, The Incredible Luck of Alfie Pluck, Johnny Casanova, Free The Whales, The Last Chocolate Biscuit and Giddy Goat, and talk to the children about writing in general and my experience as a writer in particular. By demonstrating that my stories are inspired by ordinary, everyday events I hope to show them that everyone has the potential to write. My sessions are aimed principally at children aged 7-11, but I am happy to read my picture books to the younger children. Sessions for younger children (up to the age of 7) last between 20-30 minutes. Sessions for the older children (7-11) last for approximately one hour with Questions and Answers at the end. If there are lots of questions, I am happy to stretch to 75 minutes. Schools tend to put year classes together so that I am doing 3 one-hour sessions during the day with time at the end for signing books. If you want to meet Jamie in person and find out which books to buy click on one of these links NOW! 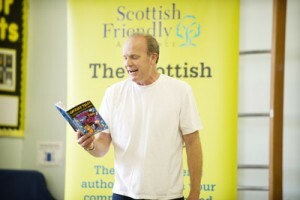 Jamie performing during a tour of schools in Argyll and Bute organised by the Scottish Book Trust.